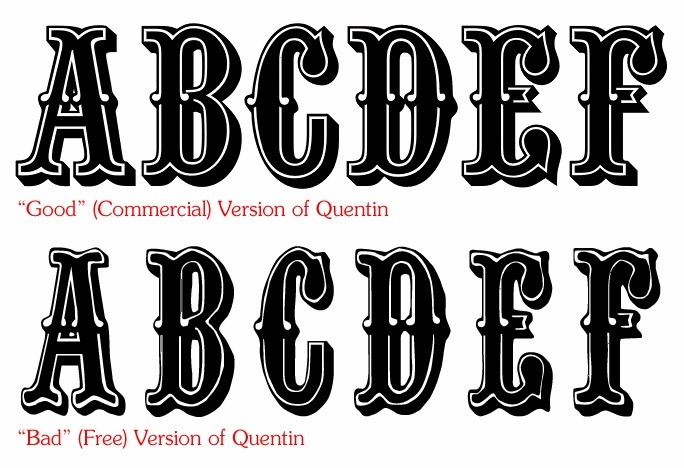 Tim Shorts made a request in regards to yesterday's typography post, asking what differences to look for between poor and professional quality fonts. Really, there are just two main issues, but I'm lumping in a third (mostly because it irks me as a type purist). Most often, this happens because some jackass with a scanner and a freeware font editor thinks he knows what he's doing. Look at the Quentin examples above. The commercial version is clean, has smooth curves, and (most importantly) has evenly spaced stroking!!! (Compare the white "inline" spaces around the outer edges.) I have no doubt that type offender of this free version below was not intending to create a "grunge" version of this typeface. But that's what you're getting if you download the freebie of this one. A great commercial version of this typeface is available for only $19.95. First, I want to make sure you understand the difference between tracking (a.k.a. letterspacing) and kerning. Tracking/letterspacing is the overall spacing between letters for an entire word or line of copy. Kerning, on the other hand, is the spacing between two individual letters. A good way to judge whether a word is kerned well or not (that is, the individual letter pair spacings look good or not) is to look at the spaces between letters and imagine pouring water into the space. For example, the left-hand side of a lower case a" indents a bit, it would hold "a slight bit more water," and the space should be adjusted accordingly. Two lower case l's on the other hand, would not have the same issues. 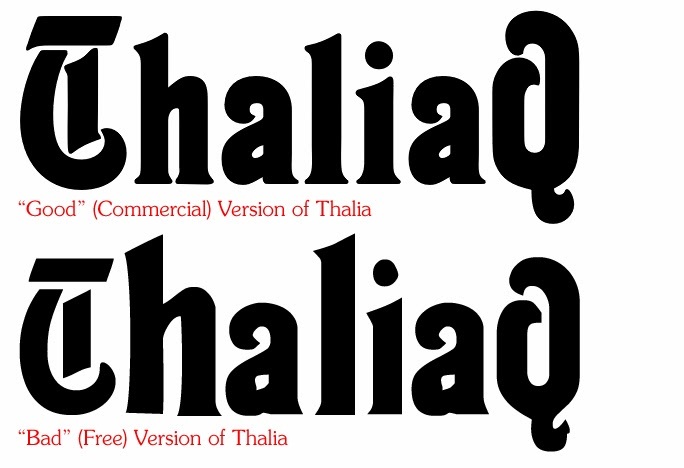 In the Thalia example above, not only is the bad/freebie version guilty of Egregious Type Transgression #1, it's also a victim of bad kerning pairs. Look at the commercial example... notice how the letters are spaced to have an appearance of even spacing (even though if you mechanically measured them left-to-right from letter-bottom-to-letter-bottom they would vary slightly). Now look at the bad example on the bottom... what the hell is going on between the "a" and "l"? (And, no, I did not make it look like that; all I did was type the word in Photoshop.) Most places charge $39.95 for a good version of Thalia. I did, however, find a good commercial version of Thalia for $19.95. Egregious Type Transgression #3: Artistic License? I have to admit, I'm a bit of type purist and all-around type nerd. I'm also one to respect an artist's original intentions. I'm not going to go changing stuff just because I can. Let me give you an example... Claude Garamond (designer of the original Garamond typeface) spent his entire life crafting and perfecting his type. In fact, the quality of Garamond's type was so good, he is credited with the elimination of Gothic/Romanesque styles from compositors’ cases all over Europe1. So, here's a man that dedicated his entire life crafting his typeface based on historical Roman forms, but any jackleg with a computer but no typographic training can "on a whim" decide to F up a man's life work in seconds by condensing it to 50%! Messing with type on the computer is like wearing spandex... just because you can doesn't mean you should. So where am I going with this? Look at that T! Otto Eckmann crafted the type he wanted, and it didn't have that style T. Change the font if you want, but change the damn name would you!? I don't know... call it "Eck-Man" or "Eckmannn" or "Eckmon" for all I care, but don't try to pass off your uninformed decision as some other man's work! Especially if does not share the same finesse as the original. Compare the subtleties of the letterforms' curves. The commercial version (directly from Eckmann's original work) is artistic and aesthetically pleasing. The bad freebie is clunky, slightly misshapen, and most importantly, it's not Eckmann. The reason I called this transgression "artistic license?" (with a question mark) is that there is nothing artistic about this designer's license. 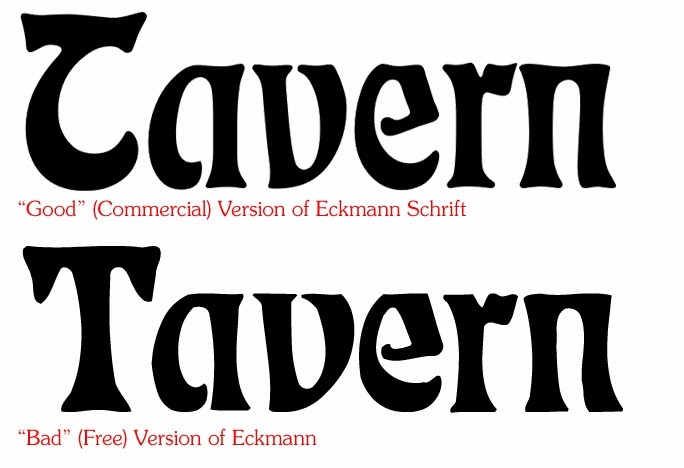 An "officially licensed" Linotype (the 127-year-old type company) version of Eckmann Schrift is available for $29. 1. Meggs' History of Graphic Design, Philip B. Meggs and Alston W. Purvis, 5th edition, 2011. I've enjoyed these posts on fonts -- very educational! Excellent post. 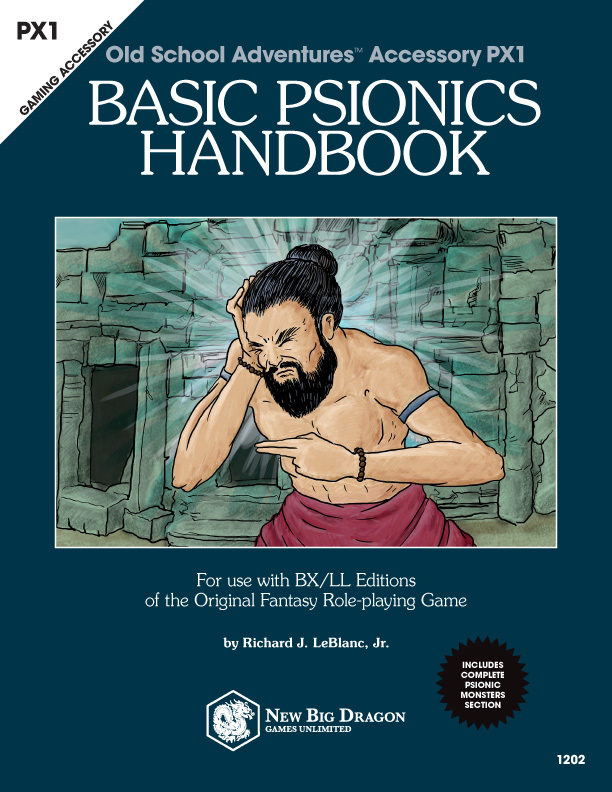 I'm going to share it with the RPGZines community. Thanks for taking the time to write this post. Heuristica feels very nice, I'd like to see how it would look in one of my larger documents. Can you recommend a sans serif font that complements it? Thanks, very interesting! I love reading about publishing topics from people who know what they're talking about! Thanks for the great reception of these posts!!! I'm working on a couple of new posts stemming from these, and hope to have them in shape by Monday/Tuesday. @KD: One of the posts I'm planning is going to touch on type combinations and my tips for effective ones. But in the meantime, I'm playing with something using Heuristica. I'll have to get back to you on that. I ended up using TeX Gyre Heros for now. It's fairly clean, reasonable width (and I've got a condensed version if needed), and has crisp corners -- I'm not hugely fond of the rounded line ends of some of the other fonts, at least not how I'm using it. I am open to changing it, however, if I find something that makes for a better match that also works well in the diagrams I'm working on. Have you tried TexGyre Adventor? 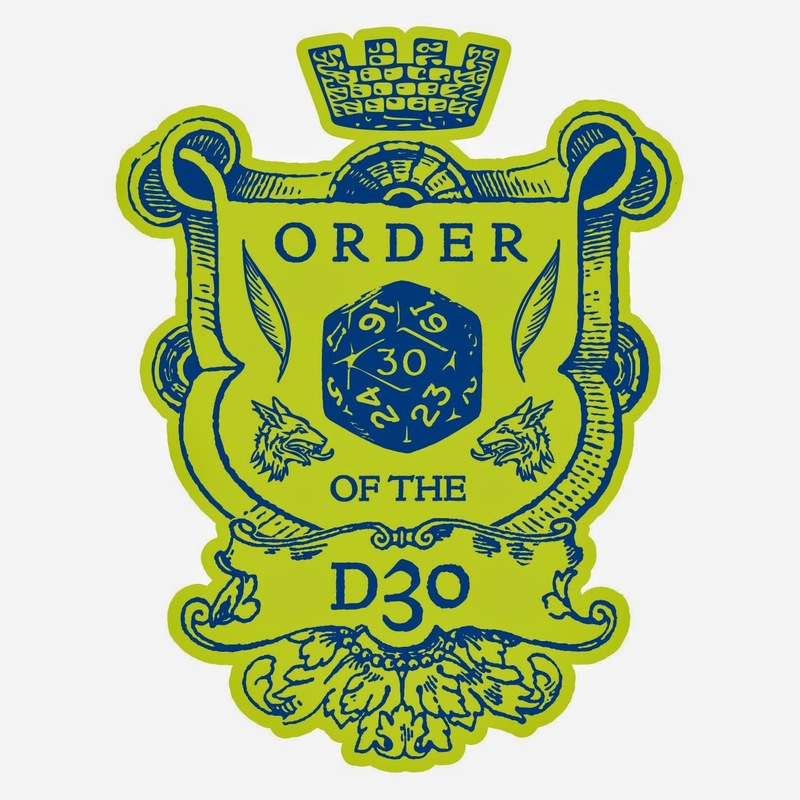 It's based on Avante Garde, the font from the original run of D&D modules. I've been using it on a couple of things lately. I hadn't. Hmm. I think the font looks good, but I need something a little more condensed where I'm using it. I think Heros works better. TG Adventor might work better in the headings, but I am reluctant to add a third font. Hmm. The other members of the TeX Gyre series look pretty good too. I quite like Heuristica, but I might see how this document looks with TG Schola, TG Termes, or TG Pagella for the body text. One thing that's plagued me substantially with my typeface selection is the licensing. For a significant portion of Linotype's offerings it's essentially impossible to use them in commercial PDFs. Another vendor was cheerfully offering ebook rights at something like $200 per book, per font until howls of outrage knocked it down to $30 or something. I've ended up almost exclusively using fonts from Adobe's storefront because they clearly label those fonts that can be used for commercial PDFs and ebooks, and don't charge extra for the licensing. Just looking the for-pay examples you give, Eckmann Schrift's epub licensing is actually $58, Myfonts wants $40 to let you use Quentin in a single PDF, and Fontshop simply does not offer Thalia in an App+ license, which is the only license which allows commercial PDF use. At a small publisher level it's very unlikely that a publisher would actually get called on this, but it's very frustrating for someone who tries to stay within the law. @SN: That's one of those area where I know most of us fail. I've been trying to look into font obfuscation/mangling as a possible solution to this issue (for those who might not know what that is, the idea is that if a font is obfuscated/mangled and cannot be extracted from the PDF/ePUB, then it technically doesn't violate some licenses for font use/distribution since the font would be unable to be extracted from the document, and therefore "unusable" as a font in the published form, other than reading it in the context of the PDF/ePUB in which it is contained.) Unfortunately, I'm not as technically inclined as I am graphically, so the little bit of research I've done into the area has me going, "Huh?" Is this something you've looked into and have any thoughts about? I've wanted to use Sabon before but I've been unable to find a cleanly-licensed version, so I looked into ways to get around these legal limitations. The only path that seems somewhat legally defensible is to rasterize/outline the font in the document, converting it to a set of images rather than text. Unfortunately, this is largely unacceptable to customers due to the vastly increased size of such PDFs, plus you lose all of the hinting you get out of a properly-made font file. It all boils down to the problem that the PDF reader itself has to be able to read your file, and they're not really designed to specifically _not_ extract font information without licensing permission. I haven't found any other method that seems to both answer to the license and serve customer needs adequately. It's very frustrating to have all these fonts that are effectively unusable in PDF publishing, but I make do with Google Fonts, Adobe Typekit, and some unambiguously free fonts from dafont and the like.